Bilateral hemisphere stimulation, for example awake REM-phases (Rapid Eye Movement), and auditory or tactile left-right inputs for quick stress reduction. The to record your individual muscle reaction. This muscle test enables optimum coaching processes by identifying stress triggers. The accuracy of the muscle test has been objectively confirmed by research projects. wingwave® coaching is an extremely effective method to reduce stress and anxieties, stage fright, phobias, PTSD … very quickly. It helps to stabilize your inner balance and increases your creativity. Other topics are self-image coaching, confident attitude, positive self motivation, strenghtening the inner team, target visualisation, mental preparation for top performance- e.g. an important presentation or sport competition. Performance-restricting beliefs are identified and turned into resource beliefs. The goal is an emotionally stable belief basis and personal beliefs that are able to withstand the most demanding mental stress. The method is used in business as well as by artists, sports people, dentists for dental phobic patients, appretices and students. Through rapidly stabilizing your inner balance you will feel full of energy again, feel an inner peace and be ready to face conflicts. 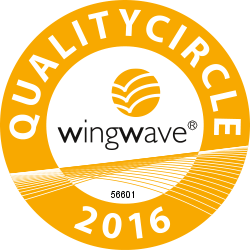 wingwave has been researched in studies at the University of Hamburg, German Sports University Cologne and Medical University Hanover. These studies have shown that for example, with only two hours of wingwave coaching a candidate who has a fear of speaking and stage fright can become a confident presenter who takes pleasure in performing. 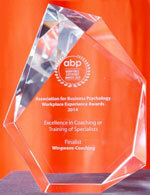 In 2014 wingwave was nominated for the Association for Business Psychology`s Workforce Experience Awards in the category “excellence in Coaching or Training”. The event was a great success, wingwave has been selected among the finalists in the face of strong competition and received acoaching trophy. If you want to know more about it there are several books written . The fundamental and practical book is available in english.